1st 4 feet long [ocean] wall. 2nd 3 feet long and 2 feet tall [ocean] wall is right of the 1st wall. a wood window is above the 2nd wall. 3rd 2 feet tall and 3 feet long [ocean] wall is above the window. 4th 8 feet long [ocean] wall is right of the 2nd wall. 5th 8 feet long [ocean] wall is -.1 feet left of and -.1 feet in front of the 1st wall. it faces right. a 6 feet wide curtain is 3 inches in front of the window. a sofa is left of and 3 feet in front of the 2nd wall. it faces right.a table is in front of the 2nd wall. a 3 feet tall man is -1.2 feet above the sofa. he faces right. 1st 2.5 feet tall bee is 3 inch tall [texture]. it is -3.6 feet above the window. it faces the man. it leans 70 degrees to the back. 1st small hat is -6.9 inches above and -1.6 feet left of the 1st bee. 2nd 4 feet tall bee is 8 inch wide [texture]. it is 4 feet right of the man. it faces the man. it leans 70 degrees to the back. it is on the ground. the head of the bee is black. 2nd [straw] hat is -1 feet above and -3 feet left of the 2nd bee. 1st shiny gun is -.6 feet in front of and -.5 feet left of and -2.5 feet above the 2nd bee.it faces left. 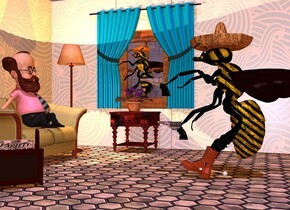 a sienna boot is -2.1 feet left of and -5 feet above and -.6 feet in front of the 2nd bee. it faces left. it leans back. a spur is -.6 feet right of the boot. it leans back.a lamp is behind the sofa. a coral light is -7 inches above the lamp.the ground is tile.the sun is storm blue. sun's azimuth is 170 degrees.sun's altitude is 79 degrees.the camera light is gentle blue.ambient light is old gold. a plant is on the table. 2nd gun is -.9 feet in front of and -1 feet left of and -3.9 feet above the 2nd bee. it faces left. the barrel of the 2nd gun is silver.a rack is in front of and right of the sofa. it faces southeast. a [newspaper] book is -1.2 feet above the rack. it faces southeast. it leans to the front. a dim orange light is 1 inch in front of the 1st bee. 1st ape is -1.2 feet above a stool. the stool is behind a drum kit. 2nd 4 feet tall ape is left of the drum kit. a keyboard is -.5 feet in front of the 2nd ape. it is 2 inches above the ground. it leans back. it faces back. a 3rd ape is right of and -2 feet behind the drum kit. it leans 25 degrees to the back. it is -.6 feet above the ground. a guitar is -4.6 feet above and -1.2 feet in front of the 3rd ape. it leans 10 degrees to the left. a .4 feet tall [pattern] upside down bowl is -.7 feet above and -2.6 feet in front of and -1.33 feet left of the 3rd ape. it leans 25 degrees to the back. a head of hair is -.9 feet above and -1.8 feet behind the 2nd ape. a dark brown head of hair is -.9 feet above the 1st ape. 4th 3 feet tall gibbon is in front of and -3 feet left of the drum kit. a metal brown head of hair is -.8 feet above the gibbon. a copper tambourine is -.7 feet right of and -1.3 feet above and -.4 feet in front of the gibbon. it leans 45 degrees to the southwest. the bell of the tambourine is silver. a optical device is -.3 feet above and -1.3 feet in front of and -1.8 feet left of the 2nd ape. 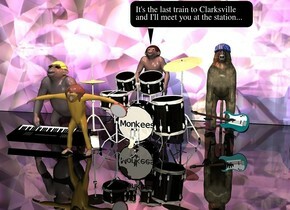 a 3.5 inch tall black "Monkees" is -3 feet above and .1 feet in front of and -4.2 feet left of the drum kit. a 60 feet long and 13 feet tall wall is 25 feet tall [texture]. it is 2 feet behind the stool. the ground is shiny black.the azimuth of the sun is 200 degrees. the altitude of the sun is 81 degrees. a coral light is 1 feet above the drum kit. [lavar] Huge Book. Miniature Rainbow behind huge book. Huge book is 2.5 feet above ground. Miniature rainbow is 1 inch above ground. Ground is dark. Terrain is .3 inches tall. Black sky. Short Yellow "Rainbow" 4 inches above book. 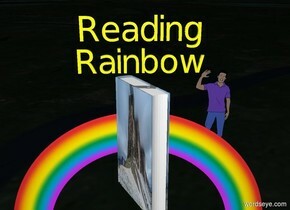 Short yellow "Reading" above "Rainbow". Foot 4 feet left of rainbow. Hand 5 feet in front of foot. Book facing hand. Carrot 10 feet right of rainbow. Broccoli 6 feet behind carrot. 5 foot tall man 9 feet left of broccoli. a 20 foot deep red car faces left. 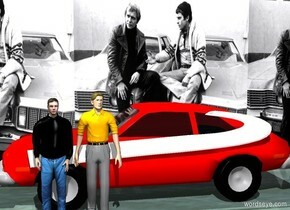 a 15 foot tall and 2.5 foot wide white iota is in front of and -4.7 feet above the car. it leans 100 degrees to the right. a 1st 7 foot tall man is in front of and -5 feet to the left of the car. the man's shirt is black. a 2nd 7.3 foot tall man is to the right of the first man. a large wall is behind the car. the wall is 15 foot wide image-11381. the camera light is gray. a ghost white light is 20 feet above and 20 feet in front of the man. Long before there was American Idol, there was. . .
a 1st 7 foot wide and 7 foot deep and .3 foot tall terracotta disk is on a 2nd 8 foot wide and 8 foot deep and .2 foot tall gold disk. a flat red orange 7 foot tall and 7 foot wide sun symbol leans 90 degrees to the back. it is on the 1st disk. a 8 foot tall and 6 foot wide maroon curtain is 1 foot behind the 2nd disk. a 8 foot tall maroon wall is behind the curtain. a 8 foot tall and 20 foot wide 50% dark orange curtain is in front of the maroon curtain. a 4 foot tall woman is on the sun symbol. she faces south. a 3 foot tall [metal] gong is 3 feet in front of and -3 foot to the left of the 2nd disk. the gong is facing right. a white ball is in front of and -1.3 foot above and -1 foot to the right of the gong. a small white stick leans 60 degrees to the left. it is -.1 foot to the left of and -1 foot above the ball. a sea mist blue light is 5 feet above and 5 feet in front of the woman. the ground is 10 foot wide wood. 1st motorcycle is on a 300 feet long road. 2nd motorcycle is right of the 1st motorcycle. the windshield of the 1st motorcycle is clear. 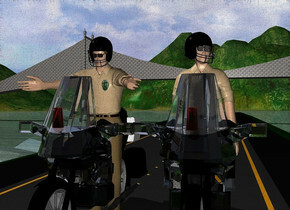 the fat windshield of the 2nd motorcycle is clear. 1st 5 feet tall man is -4 feet above the 1st motorcycle. the shirt of the man is tan. a 2nd 4.7 feet tall man is -3.8 feet above the 2nd motorcycle. the fat shirt of the 2nd man is tan. 1st .7 feet tall black helmet is -.7 feet above and -1.9 feet in front of and -1.9 feet left of the 1st man. it leans to the front. a fat .7 feet tall black helmet is -1.16 feet in front of and -.63 feet above and -1.37 feet left of the 2nd man. it leans 10 degrees to the front. it faces southeast. 1st .1 feet tall optical device is -.73 feet above and -.3 feet in front of and -.57 feet left of the 1st helmet. it leans to the front. 2nd fat .13 feet tall optical device is -.58 feet above and -.62 feet in front of and -.82 feet left of the fat helmet. it faces southeast. a .3 feet tall silver badge is -1.4 feet right of and -1.4 feet in front of and -1.3 feet above the 1st man. a [metal] bridge is 75 feet behind the 1st motorcycle. 1st upside down .4 feet tall red glass is -1.2 feet in front of and -1.1 feet above the 1st motorcycle. 2nd fat .4 feet tall upside down red glass is -1 feet in front of and -1.1 feet above the 2nd motorcycle. a 15 feet tall tower is on the beach. the beach is 20 feet wide sand.the ramp of the tower is wood. the ground is clear. 1st 6 feet tall woman is -10 feet above and -5 feet behind the tower. she faces northeast.the clothing of the woman is apricot. 2nd 6.2 feet tall woman is 5 feet right of and 1 feet behind the tower. she faces northwest. the fat garb of the 2nd woman is apricot. 1st 160 feet long and 5 feet wide and 2 feet tall clear wave is 92 feet behind the tower. it faces right. 2nd 200 feet long and 8 feet wide and 2 feet tall clear wave is 45 feet behind the 2nd woman. it faces right. 3rd 240 feet long and 12 feet wide and 3 feet tall clear wave is 60 feet behind the 1st wave. it faces right. a man is -4.5 feet above and -76 feet left of and -5 feet in front of the 2nd wave. the shirt of the man is blue. a orange red life preserver is -.15 feet behind and -.46 feet left of and -1.2 feet above the 2nd woman. it faces southwest. the ring of the life preserver is white. 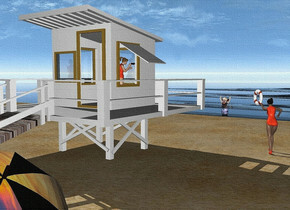 a large [beach] umbrella is 4 feet right of and -5 feet in front of the tower. it leans 35 degrees to the left. a optical device is -.96 feet above and -.8 feet right of and -.7 feet behind the 1st woman. a white airplane is on the clear cyan lake. the stripe of the airplane is red. 1st 4 feet long white blimp is -7.3 feet right of and -8 feet in front of and -6 feet above the airplane. 2nd 4 feet long white blimp is 6.3 feet left of the 1st blimp. 1st 2 feet tall man is -5 feet right of and -6 feet in front of and -4 feet above the airplane. the shirt of the man is tan. 2nd 1.5 feet tall man is 1 feet right of and -1.85 feet above the 1st man. he faces southwest. a tiny lead gray dolphin is 2.6 feet in front of and -4 feet above and -.4 feet right of the 1st man. it faces the 2nd man. it leans 30 degrees to the back. 1 dim orange light is 1 inch above and -3 inches left of the dolphin. 3 upside down wood crates are -4 feet right of and -8 feet in front of and -8 feet above the airplane. they face right. a 4 feet long and 5 feet deep wood plank is .1 feet above the crates. 3 palm trees are behind the lake. 2 date palms are left of the 3 palm trees. a .8 feet tall black nu is -.7 feet above and -2 feet in front of the 1st blimp. the ground is field. a .17 feet tall badge is -.51 feet above and -.53 feet right of and -.55 feet in front of the 1st man.the laurel wreath of the badge is green. the banner of the badge is white. the image of the badge is white. the wing of the badge is brown. the seal of the badge is tan. a 2 inch tall black "N4572F" is -3.4 feet above and -5.2 feet right of and -5.1 feet in front of the airplane. it faces right. the azimuth of the sun is 220 degrees. the altitude of the sun is 82 degrees. the sun is 20% coral. a yellow car is 6 foot in the ground. a large brown teddy bear is to the right of the car. the teddy bear's head is brown. it is on the ground. it faces southeast. a huge wall is to the left of the car. the wall faces right. the wall is 20 foot wide [House]. the ground is 10 foot wide [sidewalk]. a gold light is 20 feet above the teddy bear. a 1st 6 feet tall black person. a 8 feet tall businessman is 2 inches right of the person. the businessman's hair is beige. a 1st black woman is -1 foot to the left of the person. the 1st woman's hair is black. the 1st woman's eye is black. a 8 feet wide and 3 foot tall [hair] egg is left of the woman. it leans 90 degrees to the right. it is 4 feet in the ground. a 2nd 4 foot tall woman is left of the egg. she is on the ground. a 3.3 foot tall and 3 foot wide boy is -3 feet to the left of and in front of the 2nd woman. he faces southeast. a huge headwear is -1.5 feet above and -1 foot in front of the egg. 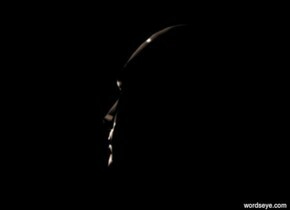 a 50 feet tall wall is 3 feet behind the person.the wall is 80 feet long.the businessman is facing southwest.the wall is rock.the ground is shiny.it is night. the second woman's hair is black. a 1 foot tall black cube is on the ground. it is 3 feet in front of the 1st woman. a .8 foot tall white hand is -.1 foot above the cube. a flat black tree is in front of the wall. the ambient light is black currant. The ground is clear. The sky is [underwater]. A building is -20 feet above the ground. It is upside down. It is 300 feet wide marble. It is leaning 35 degrees to the north. Camera light is cyan. A navy light is above the building. The sun is cyan. Ambient light is black. A huge man is in front of and above the building. He is leaning 10 degrees to the back. A green light is in front of and 2 feet above the man. A lilac light is 30 feet above the building. A blue whale is 30 feet behind and 50 feet left of and -52 feet above the man. It is leaning 45 degrees to the back. A red light is left of the whale. A maroon light is above and left of the light. 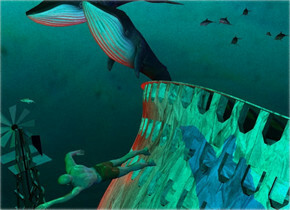 A blue whale is left of and -20 feet above the whale. A large dolphin is 30 feet behind and -30 feet above the whale. A large dolphin is 8 feet right of and below the dolphin. It is leaning back. A large dolphin is above and 5 feet right of the dolphin. It is facing the man. A large dolphin is -15 feet above and right of and 10 feet in front of the dolphin. It is facing the man. A large dolphin is 5 feet right of and 10 feet behind the dolphin. A dolphin is 3 feet left of the dolphin. It is leaning back. A fish is above and 14 feet left of the man. It is leaning back. A large shiny building is 12 feet left of and -43 feet above the man. It is facing west. 3 dim navy lights are right of the man. The azimuth of the sun is 300 degrees. a door is in front of a 1st 10 foot tall beige wall. a man is 1 foot in front of the door. he faces the door. 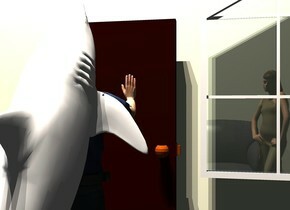 a 7 foot deep shark faces the door. it leans 60 degrees to the back. it is -5.9 feet above and -1.8 foot in front of the man. a 2nd 20 foot tall beige wall is 12 feet in front of the 1st wall. a 4 foot tall sofa is behind the 2nd wall. it faces back. the camera light is black. 3 linen lights are 10 feet above the shark. a large window is .5 foot to the right of and -4 feet above the door. a yellow light -1 foot above and -1 foot in front of the sofa. a 6.3 foot tall woman is -6 foot behind and -2.3 feet to the right of the sofa. she faces the door. a 3 foot tall and 4 foot wide and 4 foot deep white table. a 1st 4 foot tall wood chair is -1 foot to the left of the table. the chair faces the table. a 6.5 foot tall man is -4.7 feet above the chair. the chair is on the ground. the man faces the table. the man's necktie is black. 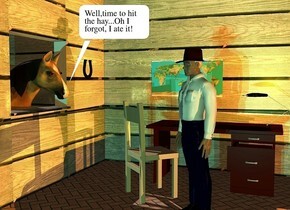 a large black wood wall is 5 feet behind the table. a .7 foot tall shiny cream mug is -2.9 feet above and -.5 foot to the right of and -1 foot behind the man. 3 large flat shiny owls are in front of and -11 feet above the wall. the camera light is mahogany. 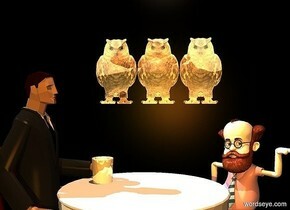 a gold light is 20 feet in front of the owls. a 4.5 foot tall white professor is -1 foot to the right of and behind the table. the professor faces southwest. a camel light is 10 feet above the table. the shirt of the professor is black currant. a [love] boat is on a 100 foot wide and 100 foot deep floor. the floor is 10 foot wide shiny [water]. the ground is 10 foot wide [love]. the ground is 10 feet high. the boat's deck is [love]. 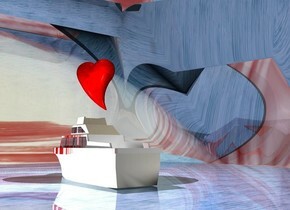 a 8 foot tall heart is 1 foot above the boat. it faces southwest. a 100 foot tall clear dodecahedron is -50 feet above the floor. the floor is on the ground. a huge ghost white light is 10 feet to the right of the boat. a huge pink light is 10 feet above the boat. 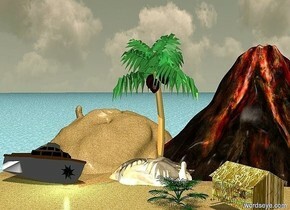 A shiny baby blue plane is above a [fantasy] island. The ground is shiny cream. A humongous clear wall is behind the plane. A black giraffe is behind the wall. 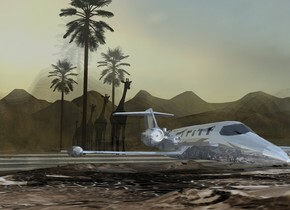 A palm tree is left of the giraffe. A humongous clear wall is behind the giraffe. A black giraffe is behind the wall. A humongous clear wall is behind the giraffe. A black giraffe is behind the wall. A palm tree is right of the giraffe. A black giraffe is 10 feet behind the giraffe. A palm tree is left of the giraffe. A humongous clear wall is behind the giraffe. A black giraffe is behind the wall. The ground is 110 feet high. The azimuth of the sun is 90 degrees. Camera light is cream. the man is upside down. he is in the ground. the woman is next to the man. she is upside down. the ground is sand. the cyan light is above the man. the orange light is above the woman. A 1st dog. A 2nd dog. A 3rd dog. A 4th dog. A 5th dog. A 6th dog. A 7th dog. A 8th dog. A 9th dog. A 10th dog. An 11th dog. A 12th dog. A 13th dog. A 14th dog. A 15th dog. A 16th dog. A 17th dog. An 18th dog. A 19th dog. 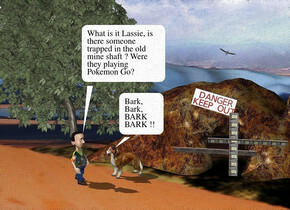 A 20th dog. A 21st dog. A 22nd dog. A 23rd dog. A 24th dog. A 25th dog. A 26th dog. A 27th dog. A 28th dog. A 29th dog. A 30th dog. A 31st dog. A 32nd dog. A 33rd dog. A 34th dog. A 35th dog. A 36th dog. A 37th dog. A 38th dog. A 39th dog. A 40th dog. A 41st dog. A 42nd dog. A 43rd dog. A 44th dog. A 45th dog. A 46th dog. A 47th dog. A 48th dog. A 49th dog. A 50th dog. A 51st dog. A 52nd dog. A 53rd dog. A 54th dog. A 55th dog. A 56th dog. A 57th dog. 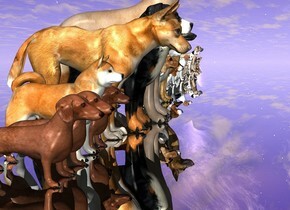 A 58th dog. A 59th dog. A 60th dog. A 61st dog. A 62nd dog. A 63rd dog. There is a gigantic pink light over the 10th dog. The ground is silver. The sky is dark lavender. The ground is water. There is a 100 foot tall white head. The head is leaning 90 degrees to the back. The head is 45 feet in the ground. A very enormous dark purple rectangle is 150 feet to the left of the head. The rectangle is above the ground. A marble is on the rectangle. There is a very small man. The man is 1 inch in front of and 15 feet to the right of the marble. The man faces the head. 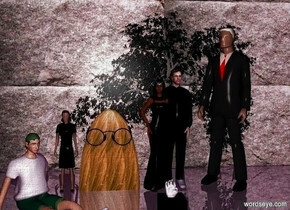 There is small shiny red woman 15 inches behind and .5 inches to the right of the man. The woman's clothing is dark red. The woman's hair is orange. The woman is 15 inches in the rectangle. The woman faces the head. A 1st large black cross is 60 feet to the right of and 5 feet in front of the man. The 1st cross faces the man. The 1st cross leans 30 degrees to the left. The 1st cross is 5 feet in the ground. A 2nd large black cross is 50 feet to the right of and 4 feet behind the woman. The 2nd cross leans 15 degrees to the right. The 2nd cross is 5 feet in the ground. The 2nd cross is facing the woman. A 1st gigantic cyan light is 20 feet above the ground and 50 feet to the left of the head. A 1st red light is in front of the 1st cross. A 2nd red light is in front of the 2nd cross. A 1st white light is to the left of the 1st cross. A 2nd white light is to the left of the 2nd cross. A 3rd red light is above the woman. A 2nd red light is above the man. A purple light is above the marble. A blue light is above the cyan light. A gigantic yellow light is to the right of the head. The ground is silver. There is a shiny fuschia lion. The mane of the lion is pink. 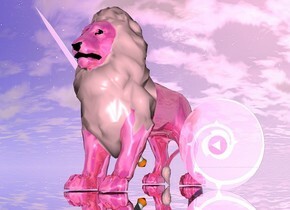 A large shiny pink sword is to the left of the lion. The sword is leaning 50 degrees to the front. There is a shiny [shield] circle to the right of the lion. The circle is leaning 90 degrees to the front. 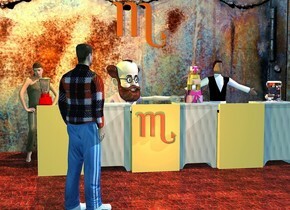 a jukebox.a vehicle is 1 feet left of the jukebox.a wall is behind the jukebox.the vehicle is 1 feet in front of the jukebox.a first man is right of the vehicle.the man is facing right.the man is black.a second man is right of the jukebox.the second man is facing the first man.a first woman is 2 inches behind the first man.a third man is 4 feet right of the first man.the third man is facing the first woman.a second woman is in front of the jukebox.it is night.a yellow light is above the jukebox.a white light is 6 feet in front of the jukebox.the wall is wood.the ground is tile. A very tiny plane is -2 feet above a huge white bird. The bird is 800 feet above the ground. 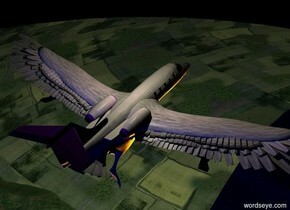 The bird is leaning 39 degrees to the front. A cream light is above the plane. It is night. Camera light is black. A navy light is 5 feet behind the plane. A purple light is -1 feet above the plane. A red light is on the ground. It is 10 feet in front of the plane. 4 orange lights are next to the red light. a 6 feet tall vampire.a 4 feet tall werewolf is 10 inches left of the vampire.a 8 feet tall monster is 2 inches right of the vampire.a first woman is 2 inches left of the werewolf.the first woman is texture.a second woman is 2 inches left of the first woman. 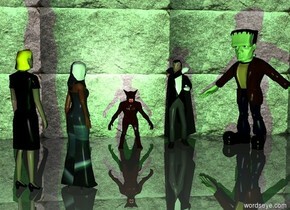 first woman.a 50 feet tall wall is 3 feet behind the vampire.the wall is 80 feet long.the first woman is 3 feet in front of the monster.the first woman is facing the monster.the monster is facing the first woman.the second woman is facing the werewolf.the wall is rock.the ground is shiny.it is night.a green light is 15 feet in front of the werewolf.the second woman's hair is yellow. 1st 10 feet tall curtain is -1.3 feet right of the 2nd 10 feet tall curtain. 3rd 10 feet tall curtain is -1.3 feet right of the 1st curtain.a 20 feet tall and 100 feet long [texture] wall is 8 feet behind the 1st curtain. a 6 feet tall woman is -10 feet to the right of and 0.7 feet to the front of the curtains. 1st 10 feet tall and 7 feet wide [texture] wall is behind the 1st curtain. 2nd 10 feet tall and 7 feet wide [texture] wall is behind the 2nd curtain. the ground is tile. a very giant [pattern] shoe is 1 feet behind and -9.6 feet to the right of the 3rd curtain. it faces southwest. 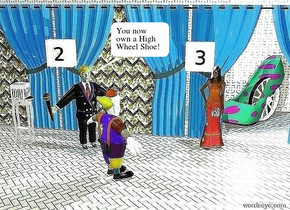 a large wheel is -5.8 feet to the front of and -4.3 feet to the right of the shoe. it faces southwest. a clown is 2 feet to the front of and 2 feet to the left of the woman. he faces the woman. 1st 2 feet tall and 2 feet wide paper is -4.5 feet above and -.75 feet to the right of and 0.1 feet to the front of the 2nd curtain. 2nd 2 feet tall and 2 feet wide paper is -4.5 feet above and -.75 feet to the right of and 0.1 feet to the front of the 1st curtain. a 1 feet tall black "2" is -1.5 feet above and 0.01 feet to the front of the 1st paper. a 1 feet tall black "3" is -1.5 feet above and 0.01 feet to the front of the 2nd paper. a man is -2.1 feet left of and -0.9 feet behind the clown. he faces the clown. a large microphone is -1.1 feet left of and -0.4 feet to the front of the man. it is 2.5 feet above the ground. it leans 10 degrees to the right. 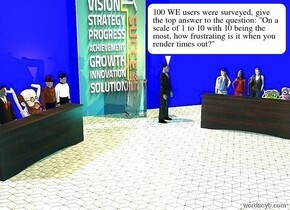 a 3.5 feet tall and 1.9 feet wide black bedside table is 1.5 feet to the left of the man. a 1 feet tall [metal] cube is on the table. the camera light is old gold. the ambient light is sky blue. a dim orange light is 2 inches above the man. a old gold light is 1 inch above the 1st paper. a old gold light is 1 inch right of the 2nd paper. a olive green light is 3 inches to the front of the woman. a cyan light is 2 inches above the woman. 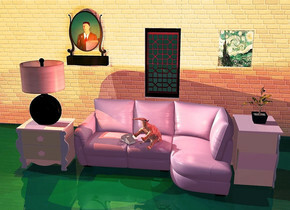 a fushia light is 3 inches in front of the woman. a aqua light is on the shoe. The sky is 2000 feet wide [nebula]. The ground is silver. 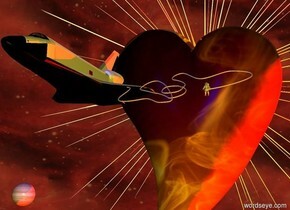 A spaceship is 150 feet in front of and -150 feet above a 200 feet wide heart. The heart is 260 feet wide [fire]. The heart is 500 feet above the ground. 8 red lights are below the heart. 2 orange lights are above the heart. A blue light is above the spaceship. An enormous cream rope is -54 feet above and -5 feet to the right of the spaceship. It is facing north. It is leaning 40 degrees to the back. A man is 34 feet to the right of and -49 feet above the spaceship. A large Jupiter is 50 feet behind and -100 feet above and 80 feet left of the spaceship. It is dusk. A 900 feet wide red star is behind and -350 feet above and -650 feet right of the heart. 12 red lights are behind the star. The azimuth of the sun is 2 degrees. The sun is mahogany. Camera light is lemon. The small pole is 5 feet in front of the first house. Five trees are behind the house. A second small house is 5 feet behind and 18 feet to the right of the first house. It is facing left. The [texture] car is 6 feet in front of the pole. It is facing back. The white transparent ground. The large silver sphere is 6 feet to the left of the car. It is 1.5 foot in the ground. The large lime sphere is 2 feet in front and to the left of the silver sphere. the silver sphere is on the ground. The large gold clear sphere is 1.5 feet in front and 1 foot to the left of the lime sphere. The large clear orange sphere is 2 feet behind the silver sphere. The large red sphere is 3 feet behind and to the right of the clear orange sphere. The large purple sphere is 1 feet behind the red sphere. The large tan sphere is 2 feet behind and to the right of the purple sphere. The aqua alien is on the clear orange sphere. It is facing back. The red light is 2 feet in front and -8 feet above the first house. The green light is 7 feet to the left of the red light. The blue light is 6 feet to the right of the red light. It is 3 feet above the ground.camera light is black. It is dusk. The mauve light is 5 feet to the left of the second house. 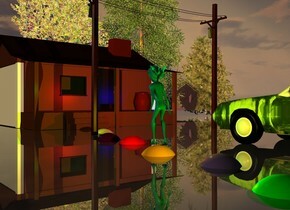 The yellow light is 2 feet in front of the alien. the large aqua flower is 4 foot in the alien. the woman is in front of the three small trees. she is facing left. the four potted plants are 3 feet in front of the woman. the tiny river is -10 feet in front of the potted plants. the ground is shiny grass. it is 200 feet wide. 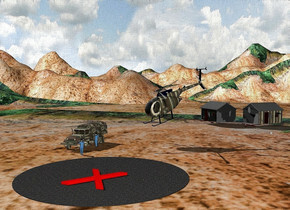 the silver helicopter is 6 feet to the left of the woman. the dress of the woman is white. the man is 4 feet to the left of the woman. he is facing the right. 1st 3.5 feet tall [metal] table is left of the 1st stove. 2nd stove is left of the 1st table. 2nd 3.5 feet tall [metal] table is left of the 2nd stove. 3rd stove is left of the 2nd table. 3rd 3.5 feet tall [metal] table is left of the 3rd stove. a woman is 0.5 feet in front of and -0.7 feet to the right of the 1st stove. she faces back. a 6 feet tall teacher is 0.5 feet in front of the 2nd stove. he faces back. a man is 0.7 feet in front of the 3rd stove. he faces back. a red blender is -0.1 feet above and -0.6 feet right of the 1st stove. a silver electric mixer is on the 3rd table. it faces southeast. a [texture] wedding cake is on the 2nd table. it faces back. 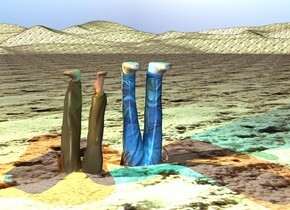 the ground is [tile]. a 15 feet tall and 75 feet long [door] wall is 4 feet to the front of the 2nd stove. it faces back. a athlete is 4 feet behind and -1.2 feet to the left of the 1st stove. he faces southwest. the shirt of the athlete is [plaid]. a 3 feet tall old gold scorpio is 3.9 feet to the front of the 2nd stove and 7 feet above the ground. it faces back. a copper scorpio is 0.02 feet to the back of the 2nd stove and 1.5 feet above the ground. it faces back. The camera light is dim gray. the ambient light is sky blue. a orange light is 4 inches above the woman. a purple light is 3 inches above the electric mixer. a copper light is 5 inches behind the copper scorpio. a olive green light is 2 inches above the athlete. 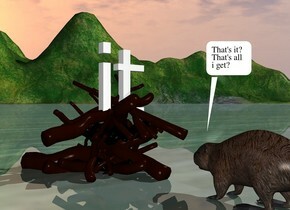 the fire is a foot in front of the beaver. it is in the ground. another fire is in the fire. it is facing right. another fire is on the fire. it is facing left. another fire is on the fire. it is facing back. the "it" is on the fire. It is facing back. The small pole is 5 feet in front of the first house. Five trees are behind the house. A second small house is 5 feet behind and 18 feet to the right of the first house. It is facing left. The [texture] car is 6 feet in front of the pole. It is facing back. The white transparent ground. The large mauve sphere is 6 feet to the left of the car. It is 1.5 foot in the ground. The large lime sphere is 2 feet in front and to the left of the mauve sphere. The large gold sphere is 1.5 feet in front and 1 foot to the left of the lime sphere. The large orange sphere is 2 feet behind the mauve sphere. The large red sphere is 3 feet behind and to the right of the orange sphere. The large purple sphere is 1 feet behind the red sphere. The large tan sphere is 2 feet behind and to the right of the purple sphere. 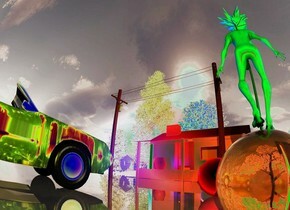 The aqua alien is on the orange sphere. It is facing back. The red light is 2 feet in front and -8 feet above the first house. The green light is 7 feet to the left of the red light. The blue light is 6 feet to the right of the red light. It is 3 feet above the ground.camera light is black. It is dusk. The mauve light is 5 feet to the left of the second house. The yellow light is 2 feet in front of the alien. the large aqua flower is 4 foot in the alien.